My son’s beloved cat has been missing for a week [update: she came back!] and we are sharing his sadness. So in honor of Shiva, I looked for book cover art with a cat or cats as the primary focus. There are few, I discovered. Dogs all over the place – but few cats. I was surprised by this, and did an informal assessment of picture book covers with cats. 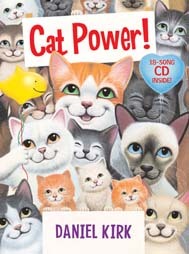 In 2007 the number of picture book covers with cats taking center stage was just about equal to the number of picture books starring dogs (over 30 each). So are cats only for little kids? Of course Erin Hunter’s Warriors series entries is all about cats. 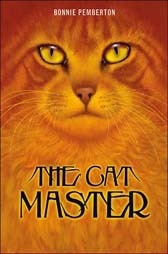 And the only other book I could find with a full on cat face looking out was Bonnie Pemberton’s The Cat Master (Marshall Cavendish 2007) – another fantasy. When I clicked into Bonnie Pemberton’s webpage – there she is holding a cat that, eerily for me, looks a lot like Shiva. 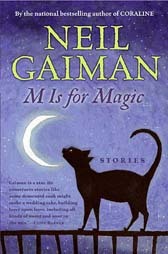 Neil Gaiman’s book of short stories, M is for Magic (HarperCollins 2007) shows a cat silhouetted against the night sky with a crescent moon, Louise Rennison’s latest entry in her Georgia Nicolson series, Love is a Many Trousered Thing (HarperTeen 2007) has a cat on it, but somehow I don’t think there’s much cat in it. 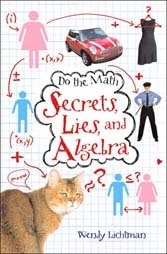 And Wendy Lichtman’s Do the Math: Secrets, Lies, and Algebra (Greenwillow 2007) has a cat… who does math? Really only one of these books is about cats. 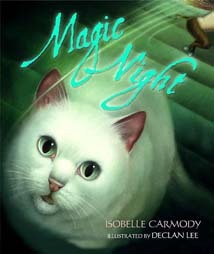 And a sample of picture books with cats… The prettiest cat – on Magic Night by Isobelle Carmody (Random House 2006) and power to the cats with CAT POWER! by Daniel Kirk (Hyperion 2007) a book of poems, which comes with a CD of the author singing them (I’ve heard Daniel Kirk sing a few in person – they’re hilarious!). 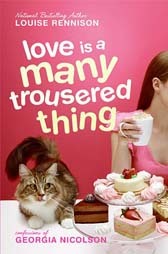 The question I came away with in the quest for cat covers is why cats don’t draw readers like dogs do. Do we know that they don’t? Cats are for fantasy, but if you want a heartwarming animal story it’s got to be about a dog? Are publishers turning down cat stories, but publishing those written about dogs? I had never noticed the dearth of cats in fiction for older kids and teens. I’ll be paying more attention from here on in. This entry was posted on December 29, 2007 at 2:33 am and is filed under book covers. You can follow any responses to this entry through the RSS 2.0 feed. You can leave a response, or trackback from your own site. My thoughts are with your family. I hope Shiva returns. Angus is definitely a supporting character in the Georgia Nicholson books by Louise Rennison. He’s named outright in the first book’s title! 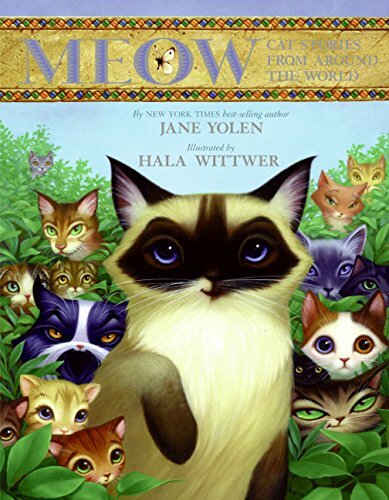 I highly recommend Meow: Cat Stories from Around the World by Jane Yolen, illustrated by Hala Wittwer. Here’s the cover. The stories are fun and the illustrations are adorable and gorgeous. I do hope you find your son’s cat – ours went missing this year for 5 horrifically worrying days but we found her :) She’s the original scaredy cat and something had frightened her and she’d run too far from home to find her way back. An illustrator who has done the most beautiful cat stories illustrations I know is Nicola Bayley in The Mousehole Cat and The Patchwork Cat – do look her up. I wrote about both on my blog. She has done others as well. I’m glad she came back! You’re right, I can think of a ton of dog books for elementary readers, but not nearly as many about cats. However, one I really enjoyed was The Amazing Story of Adolphus Tips. Yes, I’ve actually considered doing a follow-up post with some of the good cat covers I’ve discovered since this post – Adolphus Tips being one.